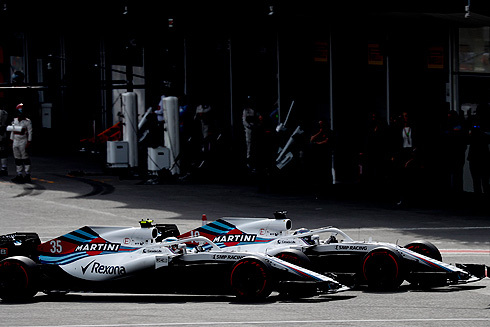 The 2018 Azerbaijan GP would be a race of mixed fortunes for the Williams Martini team. For team driver Lance Stroll his race would see him survive several incidents which would produce several Safety Car periods. He was able to bring his car home in 8th position securing the first points of 2018 for the Williams team. 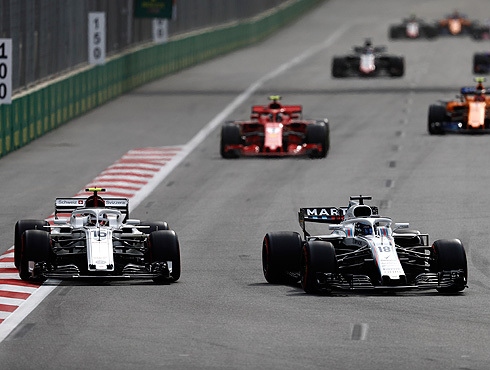 But for team-mate Sergey Sirotkin his race would see him retire after a messy race start involving several drivers but it would see him made contact with other cars such that his Williams was too badly damaged to continue. 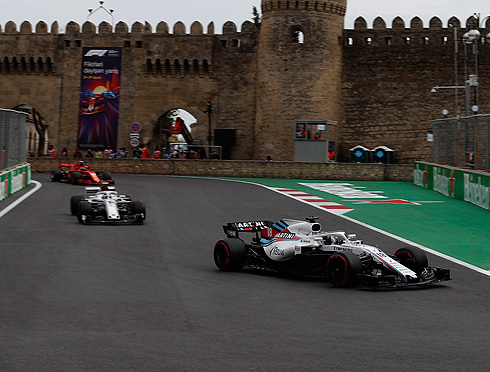 After qualifying and driver penalties we would see the Williams Martini drivers Lance Stroll and Sergey Sirotkin start the fifty one lap 2018 Azerbaijan Grand Prix from 10th and 11th. They would have the choice of tyres for the start and they would start on. At the front of the grid it was Vettel on pole from Hamilton, Bottas, Ricciardo, Verstappen, Raikkonen, Ocon, Perez, Sainz and Lance in tenth. The top five would start on used supersoft tyre with the rest of the top nine on the ultrasoft tyre. For Williams both drivers were on new supersoft tyres. The wind was quite high which may make conditions difficult for the drivers. The grid would complete their formation lap and would return and with the lights going out it would be very messy with the Safety Car been deployed with Hamilton in second. 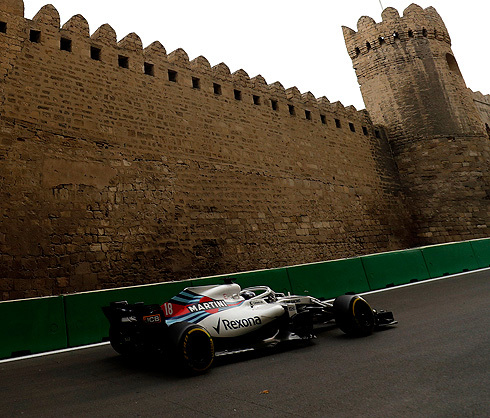 For Williams Sergey's race would end before the first lap was completed with damage to his front left. Ocon would also go into the wall after making contact with Raikkonen. Bottas was third followed by Ricciardo, Verstappen, Sainz, Lance, Perez, Hulkenberg and Gasly tenth. Several drivers would pit after the first corner contacts including Raikkonen, Magnussen, and Alonso. It was the case that Sergey had made contact with Alonso after been squeezed by Hulkenberg. All those who had pitted had switched to the soft tyre. Others who had pitted but had gone onto another tyre was Hartley and Grosjean who changed to ultrasoft and supersoft respectively. The Safety Car would come in on lap seven and Gasly would pass Lance while Verstappen was to make a move on Ricciardo allowing Sainz also to get past. Hulkenberg would get past Lance for eighth. Lance was now ninth while Sainz continued to attack Verstappen. Vettel was leading Hamilton by 3.5 seconds while in tenth was Leclerc while Sainz would finally get past Verstappen to be fourth. In the other Renault Hulkenberg was sixth followed now by Ricciardo and Lance. Hulkenberg would get past Verstappen using the DRS to be fifth. Lance was now in eighth and right behind Ricciardo while at the front Hamilton was closing on Vettel. It would go wrong for Hulkenberg when he would have damage after hitting the wall ending his race. This would see Lance move up to seventh still behind Ricciardo. Ricciardo would try to get past Verstappen but the pair would make contact when they were running side by side with Verstappen not giving his team-mate an inch. Leclerc would get past Lance for seventh while Sainz was still running in fourth. Vettel would find some pace extending his lead out to 3.5 seconds after fourteen laps. Raikkonen would pass Lance for eighth seeing the Williams driver now ninth. Sainz would pit from fourth on lap seventeen. He would go onto the soft tyre in what should be his only stop. He would return in thirteenth. Raikkonen was now in sixth having passed Leclerc. Perez was now right behind Lance with twenty laps completed and he would get past and would fall quickly away from the Force India. Lance was now ninth and had Grosjean behind him and closing. Hamilton would pit on lap twenty four taking on the soft tyre. This would happen after Hamilton ran wide at Turn one as he struggled with his tyres. He would return in third and just ahead of Verstappen. lance would pit on lap twenty six taking on the soft tyre and would return in twelfth. 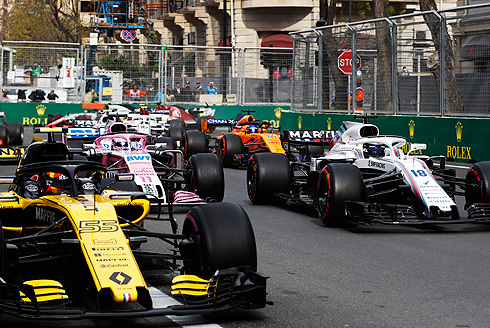 The fight between Verstappen and Ricciardo would continue while in sixth was Raikkonen followed by Perez, Grosjean, Sainz and Leclerc in tenth. Lance was now in eleventh 6.2 seconds behind Leclerc having got past Alonso. Vettel would pit on lap thirty two taking on the soft tyre seeing Bottas leading. Vettel was now second followed by Hamilton. Lance was slowly closing the gap to Leclerc but it was still over five seconds. But Lance was able to bring it down to under four seconds with seventeen laps remaining. Ricciardo would finally get past Verstappen at Turn one taking fourth place. But Ricciardo would pit on lap thirty nine taking on the ultrasoft tyre and returning in fifth. Verstappen would pit the next lap would come out in front of Ricciardo with the Red Bull's in fourth and fifth. For Williams Lance would still be in eleventh but would be 1.2 seconds behind Leclerc. But it would also change when the Red Bull cars would make contact crashing into each other and Ricciardo would hit the rear of his team-mate. This would see both of them retire. For Williams Lance was now in ninth. The Safety Car would come out and we would see a rush of pit stops with Bottas, Vettel, Hamilton, Raikkonen all stopping to take on ultrasoft tyres. Lance would also pit taking on new ultrasoft tyres. Of the top ten only Perez was not on the ultrasoft tyre. He was on the supersoft tyre running fifth. There was ten lap remaining with Bottas leading from Vettel and Hamilton. While weaving behind the Safety car Grosjean would put his car into the wall losing traction on his rear wheels. This would see Lance now in eighth still behind Leclerc. The Safety Car would come in on lap forty eight seeing Vettel make a mistake allowing Hamilton and Raikkonen past with Vettel now fourth. Lance would be past by Alonso to be ninth. But for Bottas his race would end with a puncture seeing his right rear tyre destroyed. This would see Hamilton leading from Raikkonen and Perez. Perez had passed Vettel while Leclerc was now in fifth followed by Sainz, Alonso, Lance, Vandoorne, and Harley tenth. Sainz would get past Leclerc for fifth while Lance and Alonso would swap places with the McLaren staying ahead. The final lap would be completed and it would be Hamilton who would win from Raikkonen and Perez. Vettel was fourth followed by Sainz, Leclerc, Alonso, Lance, Vandoorne and Hartley tenth. For Williams it would be their first points of the season courtesy of Lance but for Sergey it was the case of what might have been if he had not been involved in the messy start of the race.